When it comes to making dinnertime fun, there’s just nothing like a taco bar, jam-crammed with loads of yummy topping choices. Picky kiddos (and, let’s face it … even the adults, too!) appreciate the ability to make their own creations, piled high with the flavors and textures they like. It’s one of the recurring themes in all of our articles about parenting picky eaters … if you help kids feel empowered and like they’re a part of the entire meal process, then they’ll be much more likely to eat healthfully and try new foods. It really works! The super-easy, 2-ingredient hummus dressing really brings all the wonderful Mediterranean flavors together! 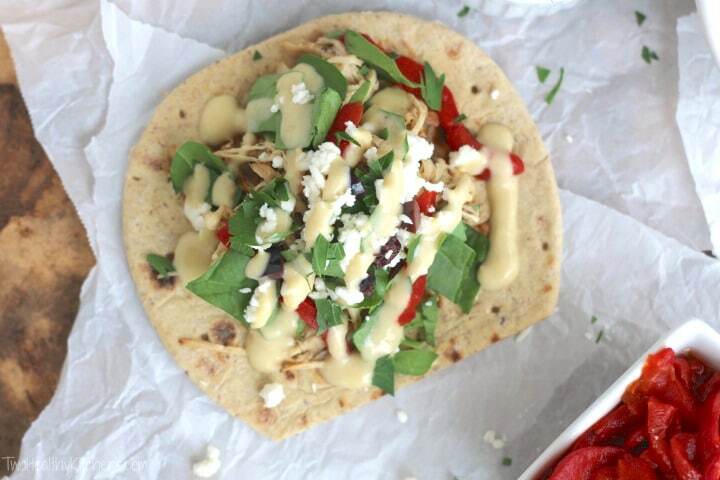 We actually saw this very principle in action when Gretchen first served her kids these Mediterranean Chicken Tacos. Her daughter proceeded to try one … along with all the other toppings she’d chosen … and guess what! (You know what’s coming here …) That suspicious-looking, roasted pepper strip turned out to be a-ok! Huh! And just like that, her daughter added one more type of vegetable to her “edible” list. Brilliant! While all of that was going on, Gretchen’s older daughter was eyeballing the feta, certain she’d never tried it before … which is ludicrous since she’s had our Baked Hummus Dip with Easy Tabouli Topping, and Super-Fast Mediterranean Herbed Shrimp Pasta, and Citrus Quinoa and Chickpea Salad – to name a few! That kid has eaten more feta than she realized! And … you guessed it! 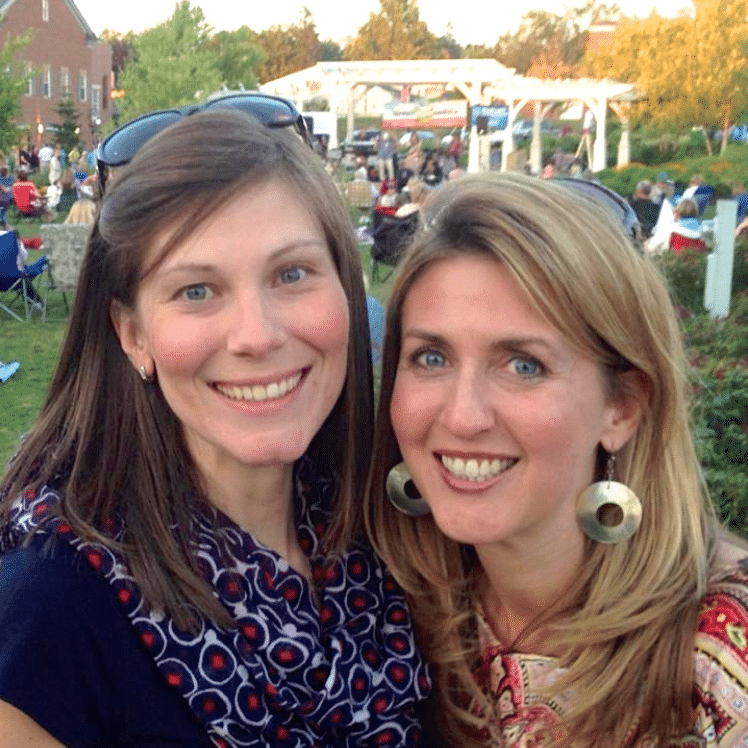 She felt empowered enough to try it (again) … and she loved it (again! 😀 )! This is why we really love Flatout’s goal to give kiddos lots of healthy options, through their #FlatoutIsMyCanvas campaign. Flatouts are deliciously nutritious little blank canvases, just waiting for kids to fill in the spaces with healthy foods they love. These easy-to-make, yummy-to-eat Mediterranean Chicken Tacos are a perfect recipe to showcase how a blank canvas can become a delicious work of art … and how each artist’s masterpiece can be personalized and unique! So, let’s build some tacos! 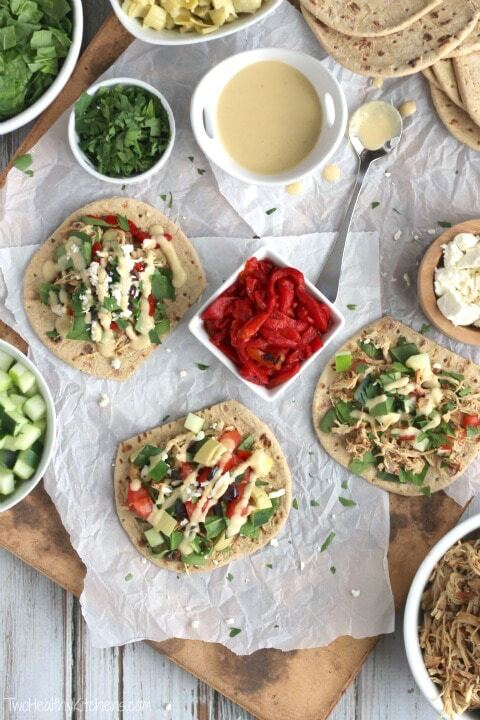 To start the taco bar fun, we like offering a variety of flatbread options. Flatout Foldits, cut in halves, are the perfect starting point for mini tacos. These tiny, personalized tacos are terrific because everyone can build different combinations throughout dinner. They’re also great if you’re serving this taco bar at a party – the little Foldits are ideal for your guests to make perfectly sized party snacks (hello, game day food!). For those who’d rather create one big, burrito-style soft taco, the larger Flatout wraps are just right. 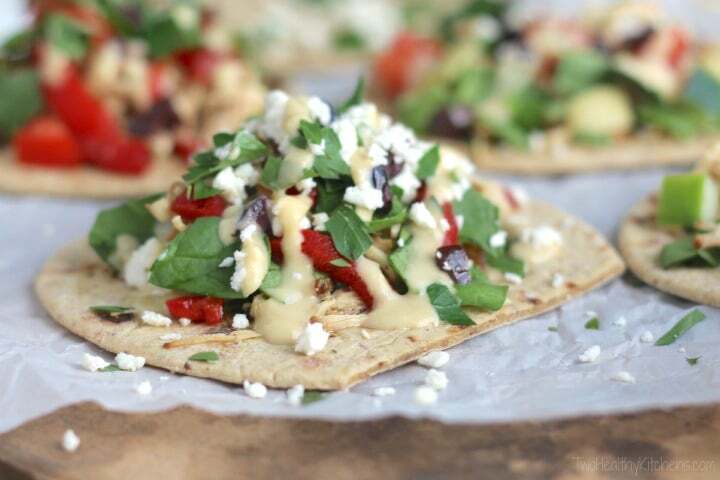 Although there are lots of great whole-grain, high-protein Flatouts to choose from, we found that the Red Pepper Hummus wraps and the Light Italian Herb wraps had flavor profiles that perfectly complemented the other Mediterranean ingredients in these chicken tacos. 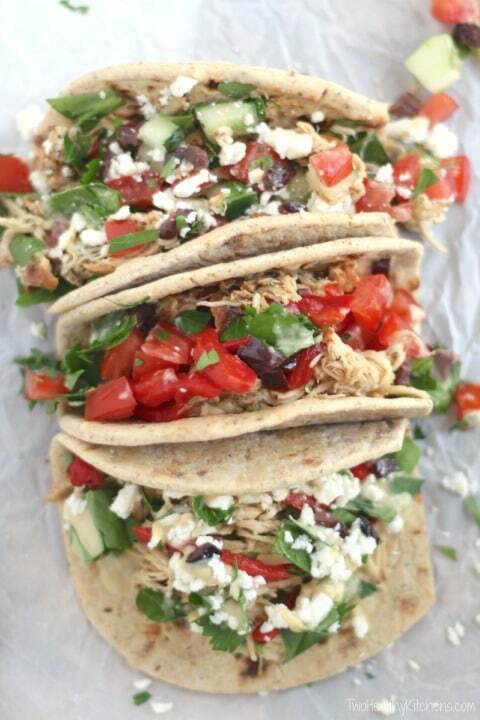 The chicken in these tacos is mildly seasoned with Mediterranean flavors and Greek-inspired spices – a perfect building block for the bursting-with-flavor toppings that are just waiting to be piled on top. And now (drum roll, please …) the toppings! This is where the fun really starts and where the big flavors begin. We’ve got a whole list of suggested toppings for you – and when we make this taco bar in our own homes, we usually do offer all the options (and Gretchen and I both love to pile them allllll on!). But just like with Mexican-style taco bars, you can definitely feel free to improvise and offer whatever you think your family will like best. With so many great, healthy topping choices, any toppings your kiddos choose are a win. And every single one adds up to more big flavor! Salty kalamatas and feta? Check! Vibrantly fresh tomatoes, cucumbers, spinach and parsley? Yup – got those, too! Wanna jazz it up and go a little highbrow with artichokes and roasted peppers? Sure thing – just pile ’em on! There’s no wrong answer here, friends – build your tacos any way you like! Just don’t skip the yummy hummus dressing! It’s crazy-easy to whip up, but absolutely pulls all the flavors together. 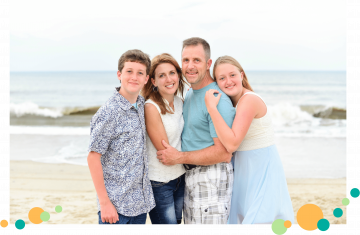 And don’t forget to offer a couple of things that you aren’t positive your kids will go for … because who knows … while they’re having fun creating their own masterpieces, they just might surprise you by trying something new! Have Fun with These Other Great Taco Recipes, Too! Lime Shrimp and Rice Tacos from Cindy at Hun … What’s for Dinner? Place chicken in slow cooker, and add vinegar, 2 tablespoons water, basil, garlic powder, onion powder, parsley, salt, oregano, and black pepper on top. Just before serving, shred chicken (with two forks) and stir back into remaining liquid in bottom of slow cooker, to incorporate. 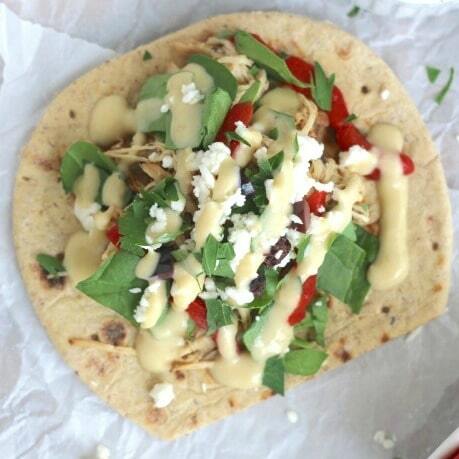 Serve chicken in flatbreads, allowing everyone to select toppings and drizzle with hummus dressing, as desired. 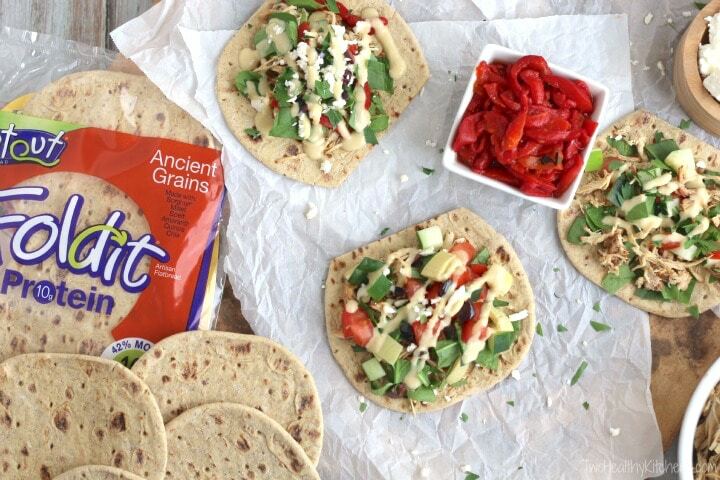 Flatbread options: If you'd like to serve this recipe as mini, personal tacos for a fun dinner or as appetizer-sized party tacos, we recommend using Flatout Foldits. Cut each Foldit in half to form perfectly sized mini soft taco shells. 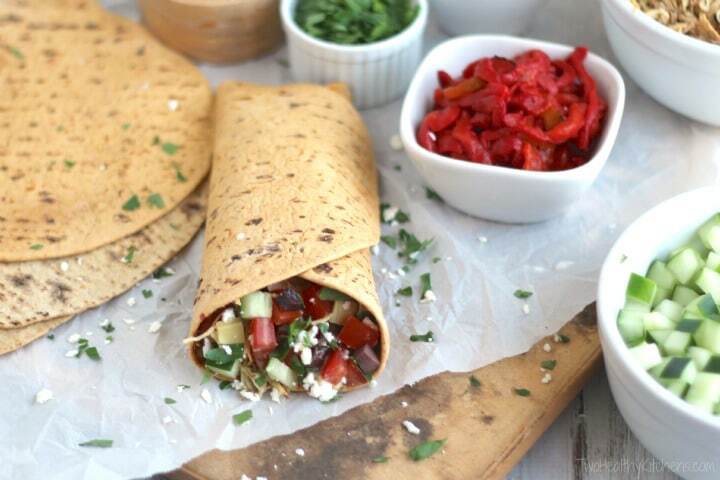 Alternately, if you'd like to serve larger, heartier-sized soft tacos, try using Flatout wraps – we found that the ProteinUP Roasted Red Pepper and Light Italian Herb varieties had flavors that paired nicely with the Mediterranean ingredients in this recipe. Make-ahead tips: Because you're using your slow cooker, you begin the chicken hours ahead of serving it. In addition, though, you can also cook it even a day or two ahead, then refrigerate it after cooking and reheat it for serving. You can also prepare and chop all of the toppings up to a day or two ahead. Store each topping, wrapped separately, in the refrigerator. 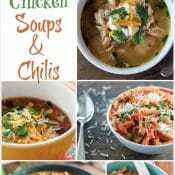 Cook time and slow cooker variations: Through all of our testing, we've found that slow cooker chicken recipes like this one typically work best in a 3-4 quart slow cooker. If you’re using a larger 5-6 quart model, we recommend cooking on low for only about 6 hours. We do not recommend cooking this recipe on high in a 5-6 quart slow cooker because the chicken may overcook and become dry. 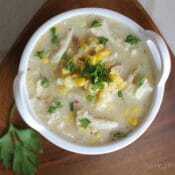 At the end of cook time, the chicken should be cooked through and should shred easily and be really moist. Also, note that the exact heat and speed of cooking can vary between different slow cookers. 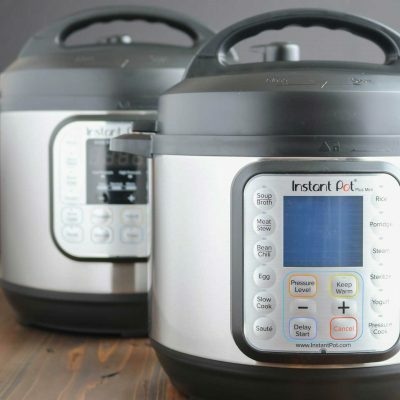 Our research has also led us to believe that some models allow for imperceptible evaporation of liquid (although you’d expect that no liquid would be lost when using a slow cooker), which can leave your recipes less saucy and moist. 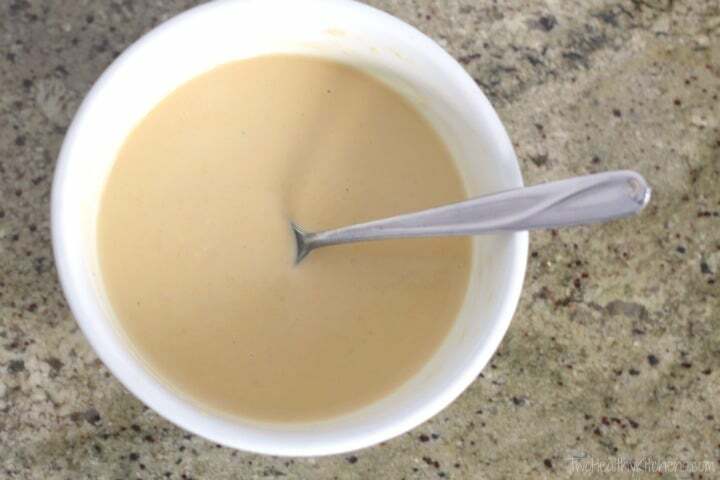 Because this particular recipe uses very little liquid, it’s particularly sensitive to these variations. No need to worry – it’s delicious even when cooked until it’s a bit drier. « Apple Monsters – A Nut-Free, Healthy Halloween Treat! Thank you so much for this recipe! My friends and family LOVED the Greek taco bar idea, and my husband and I love the chicken so much, I now make a batch of it on Sundays to use for lunches throughout the week in quinoa or salads. The only change I make is using boneless, skinless chicken thighs or a combination of thighs and breasts. Thank you so much for sharing! Oh wow, can I join the party? It looks SO tasty!! I’m sold!!! 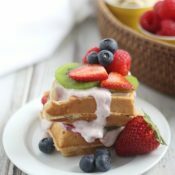 These look delightful…I love anything quick and easy during the busy week! What a great idea! I love making tacos into other types of dishes and flavors. Oh wow, love this idea. Perfect to feed a hungry crowd too! 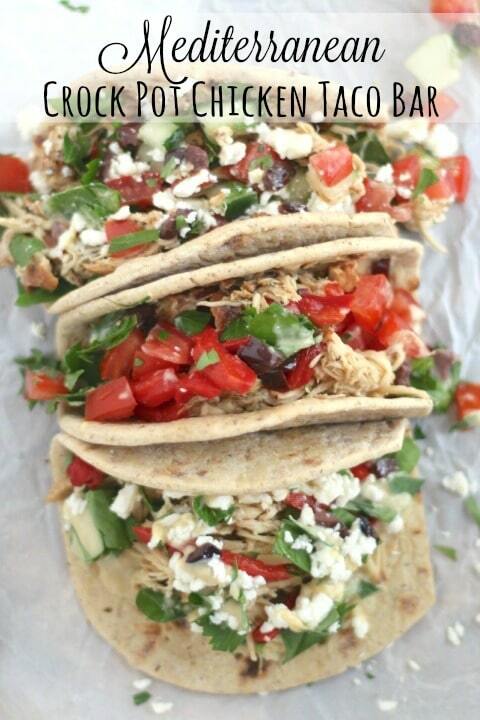 Combining three of my favorite things into one: slow cook, tacos, and Mediterranean! Dude, I’ve totally cooked chicken in root beer in my crock pot, drained it then shredded it and added BBQ sauce. It’s dreamy. But root beer in these tacos would probably not be so great haha. Maybe a more traditional texmex taco or bbq taco? sloppy joe tacos!? Perfect flavors so close to my taste buds! My son would love them too! How amazing does this entire meal look! Loving the sound of the hummus dressing, and those breads look super! What an incredibly flavorful recipe. Love it. These look incredible and that hummus dressing is calling my name! Yummy! 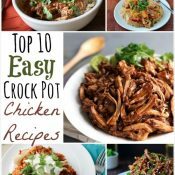 My daughter loves finding new ways to use her crockpot when entertaining her friends and this dish would be absolutely perfect! So creative and FUN! I am sending her your recipe right now! These look great! I love those Flatout breads. That’s what I used for my Mini Taco Cups the other day. And I love a taco bar. What fun it is to assemble your own food and try out different flavor combinations. 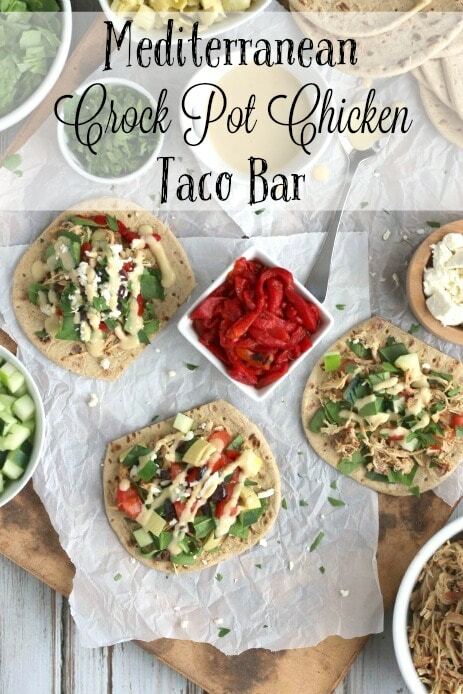 Oh, my goodness what a fab Mediterranean Chicken Taco bar! I would totally be loving this, a definite must try in my book. These look so good and the hummus dressing is perfect. That looks like MY perfect dinner! 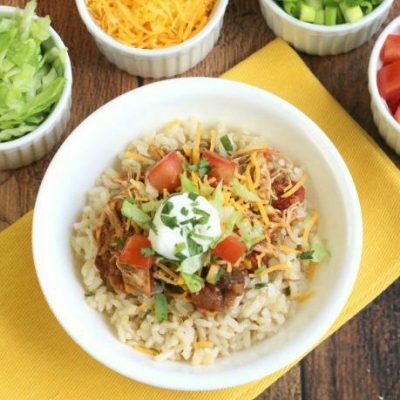 I love the idea of a taco bar and cooking the chicken in a slow cooker makes everything easy and fuss-free! Love the options you provided with the flatbread and toppings, too! It takes really good ingredients to make a good taco. You have done that here. 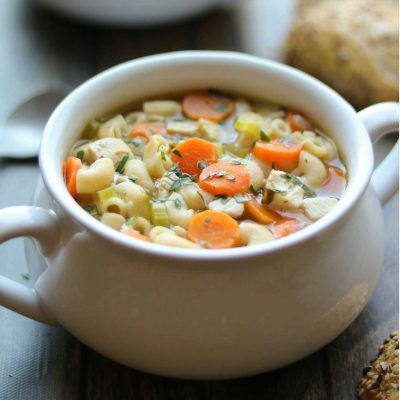 So simple to prepare and it sounds delicious! 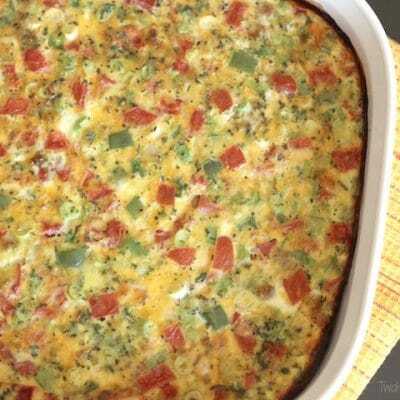 Perfect for feeding a crowd for game night or just a busy weekday evening! How yummy these look – love your taco night twist! This taco bar is literally a dream come true for me. I love the Mediterranean twist on it too. Looks like one amazing taco bar to me! This would be perfect for a pot luck! Love this idea. Perfect for the weekday dinner.